Washington, DC – Newly declassified CIA files seem to confirm certain FBI documents related to Adolf Hilter, which claimed the Nazi Fuehrer escaped Germany and took up residence in South America after World War II. The files indicate that in 1955, the chief of the CIA’s Western Hemisphere Division (WHD) received a secret memo with the subject line “Operational: Adolf Hitler,” from the acting CIA station chief in Venezuela, which indicated that one of his sources had received a tip that the Nazi Fuhrer was indeed alive and living in Argentina. Interestingly, these revelations seem to confirm declassified FBI documents that also claimed sources had indicated that Hitler was indeed living in Argentina. While the official story sold to the global public is that Hitler died of suicide in the Fuhrerbunker, the actual truth may be vastly different from the popularized version of events. 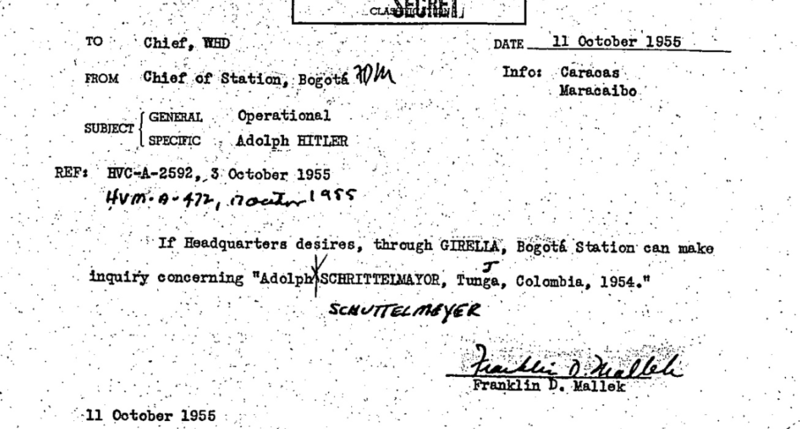 The acting CIA station chief’s informants, CIMELODY, was contacted by a former SS trooper Phillip Citroen, who claimed to have been in contact with Hitler—who was living under the pseudonym Adolph Schuttlemayer—about once a month in Colombia, while there on a trip from Maracaibo as an employee of the Royal Dutch Shipping Company. Citroen said that Hitler had left Colombia for Argentina around January 1955, and erroneously suggested that the statute of limitations for war crimes had passed—as it had been 10 years since the end of World War II—and that the Allies could no longer prosecute Hitler as a war criminal. 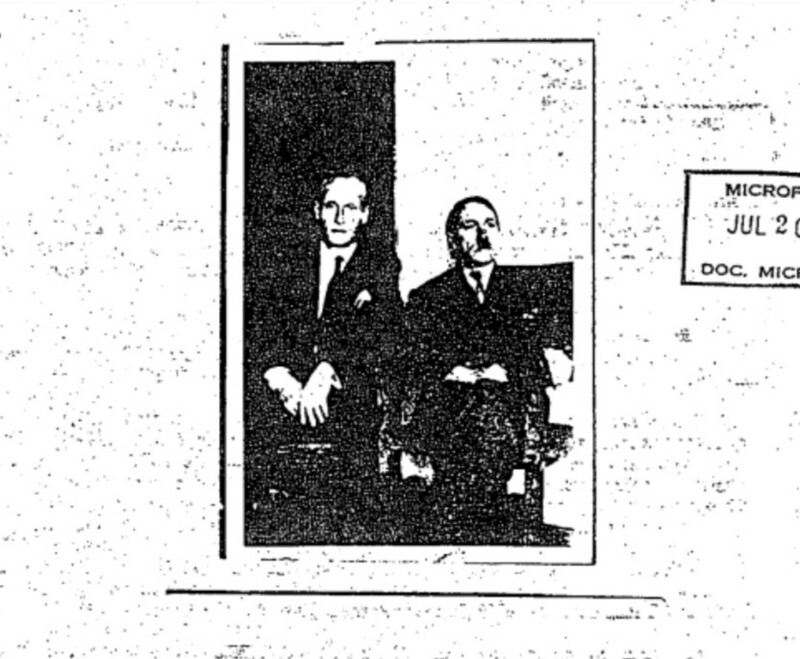 The CIA documents reveal that Citroen told CIMELODY that he had even taken a photo with Hitler, and provided a grainy picture that was included in the CIA memo—with Hitler purported to be the man on the right. After reviewing the CIA’s files, the WHD chief reported that Citroen had only the year before reported that a colony of Nazis was present in Colombia that engaged in “idolatry of the Nazi past addressing him as ‘der Fuhrer’ and affording him the Nazi salute and storm trooper adulation,” in reference to Hitler himself. The station chief wrote the WHP chief again only days later to engage in further investigation of whether or not it really was Adolf Hitler. A seemingly strange response considering the magnitude of the report and veracity of the sources credibility in that Citroen was a former Nazi himself. Perhaps there is more to the story than a war weary public was led to believe in the wake of the devastation of WWII, and the truth lies somewhere other than what has became the official narrative of Hitler’s death in the Fuhrerbunker with his bride—with reality being much closer to an escape with may other Nazi war criminals to South America.